As one of those super foods, quinoa is extremely nutrient rich and filling. It’s been said that one of the most important nutritional benefits of quinoa is simply the amount of nutrients that are packed in there. In 1955, researcher Phillip White said “While no single food can supply all the essential life sustaining nutrients, quinoa comes as close as any other in the plant or animal kingdom.” That’s pretty exciting. So, let’s find out why! Quinoa is gluten free! 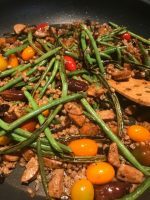 It can be used in many of the same ways as the grains we’re used to but doesn’t have the gluten that can be so hard on our digestive systems. And with that, there is also research to suggest that it may reduce the risk of colon cancer! Quinoa is a good source of protein. While most grains are not considered great sources of protein, quinoa is! Many grains can’t measure up in the protein category because they don’t have enough of the amino acids, lysine and isoleucine. So, although they may have high protein content they are not considered complete sources. But the presence of both makes quinoa a complete protein source. For example, quinoa contains 504mg of isoleucine and 766mg of lysine for every 100g while hard red spring wheat commonly used today has 541mg of isoleucine but only 404mg of lysine. Quinoa also has a particularly high protein to carbohydrate ratio which means we don’t have to eat as many carbs to get a good amount of protetin. This can help with muscle building and weight control. Quinoa could reduce the risk of type 2 diabetes. There is not very much extensive research on this specific topic with regards to humans. However, it makes sense because the nutritional makeup of quinoa is so similar to other grains proven to reduce the risk. For example, we’ve already mentioned the great quality of the protetin in quinoa. Also, it’s high in fiber which is one of the most important substances for regulating blood sugar. It also contains a lot of anti inflammatory nutrients. That is important because inflammation is a great risk factor for type 2 diabetes. 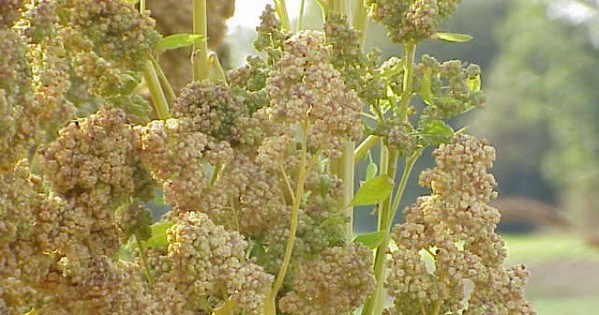 Quinoa is high in essential minerals. Specifically these are potassium, copper, and zinc. Among other things, these minerals help with the synthesis of superoxide dismutase enzyme. S.O.D helps eliminate free radicals. This could get rid of cancer cells and also helps with anti-aging. Quinoa provides good fat. Our bodies need certain kinds of fat. These are heart healthy fats such as oleic acid. Oleic acid makes up 28% of the fat in quinoa and another 5% comes from the omega-3 fatty acid, alpha-linolenic acid. These can help reduce the risk of inflammation and the associated diseases. Quinoa lowers cholesterol. Research shows that quinoa reduces bad cholesterol while maintaining the good. Already proven to reduce inflammation, it can be assumed that it does the same in our cardiovascular systems. Green, Tara. “Quinoa nutrition – why quinoa can help you lose weight and improve your health.” Natural News & Self Reliance. Natural News Network, 10 Nov. 2011. Web. 29 Jan. 2015. “Quinoa.” Whfoods.org. George Mateljan Foundation. Web. 29 Jan. 2015.